operating our system from a neutral stance independent of temporary agencies. Tempstaff Co., Ltd., and Recruit Staffing Co., Ltd. - with the goal of creating the first standardized e-commerce model in the temporary staffing industry. Six months later, in April 2003, we have finally launched services for our e-staffing Web-based one-stop temporary staffing contract management system. We are committed to making this system the de-facto standard for e-commerce in the temporary staffing industry. We are not a temporary agency. We are a provider of B2B temporary staffing contract management systems services. Our mission is to contribute to society by facilitating business between our client companies and temporary staffing agencies. In this sense, we consider our highest priority to be keeping our system in compliance with relevant laws, including the Workers Dispatch Law and Labor Standards Law. As deregulation progresses in Japan, we will respond quickly to maintain compliance with any changes in the law. We were founded as a joint venture between Japan's 3 largest temporary staffing agencies. Our goal is not to benefit any particular temporary staffing agency; rather, we aim to contribute to the temporary staffing industry as a whole. We operate independently of temporary staffing agencies, and as such, we keep any information entered by our clients and temporary staffing agencies completely compartmentalized from all other parties. You can use our system with peace of mind. Our long-term goal is to achieve a large user base, and continually lower the fees we charge to temporary staffing agencies for placements on the system. 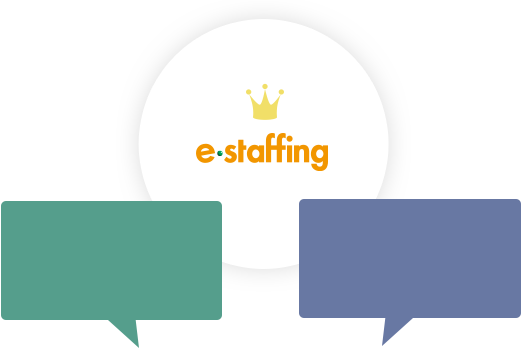 We are committed to making our system inexpensive and easy to use for temporary staffing agencies. We have a help desk, in order to quickly respond to any questions or issues that our clients, temporary staff, or temporary staffing agencies may have regarding the e-staffing system. We will also continually improve our system, not only to maintain compliance with any changes in the law, but also to allow its more effective use for temporary staffing. Copyright © e-staffing. Co. Ltd.